, corresponding to C terminal amino acids 1512-1524 of Human Dispatched. Dispatched is a novel sterol-sensing domain protein dedicated to the release of cholesterol-modified hedgehog from signaling cells. Our Abpromise guarantee covers the use of ab10142 in the following tested applications. WB Use at an assay dependent dilution. Preliminary experiments gave no signal but low background in Human Lung and A549 extracts at up to 1µg/ml. Functions in hedgehog (Hh) signaling. Regulates the release and extracellular accumulation of cholesterol-modified hedgehog proteins and is hence required for effective production of the Hh signal. Belongs to the dispatched family. 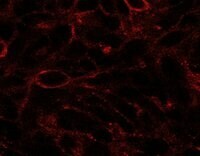 ab10142 staining Dispatched at 2.5µg/ml in U87 cells by Immunocytochemistry/ Immunofluorescence. ab10142 has not yet been referenced specifically in any publications. Publishing research using ab10142? Please let us know so that we can cite the reference in this datasheet. There are currently no Customer reviews or Questions for ab10142.